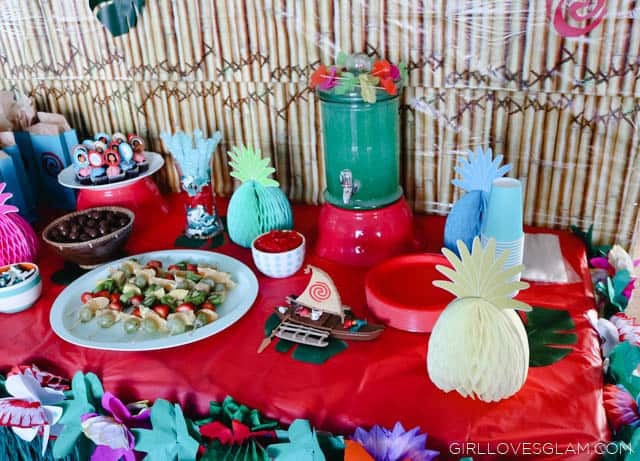 This post is all about the decor of the Moana Birthday Party. 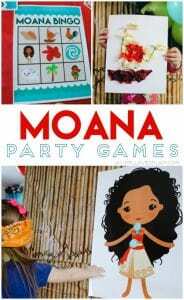 Tomorrow’s post will include all of the games and the printables you need for the games for the Moana party! We were one of the thousands of families who totally fell in love with Moana after we watched it Thanksgiving weekend. It had such a sweet story with great messages and incredible music that we all left the theater singing! 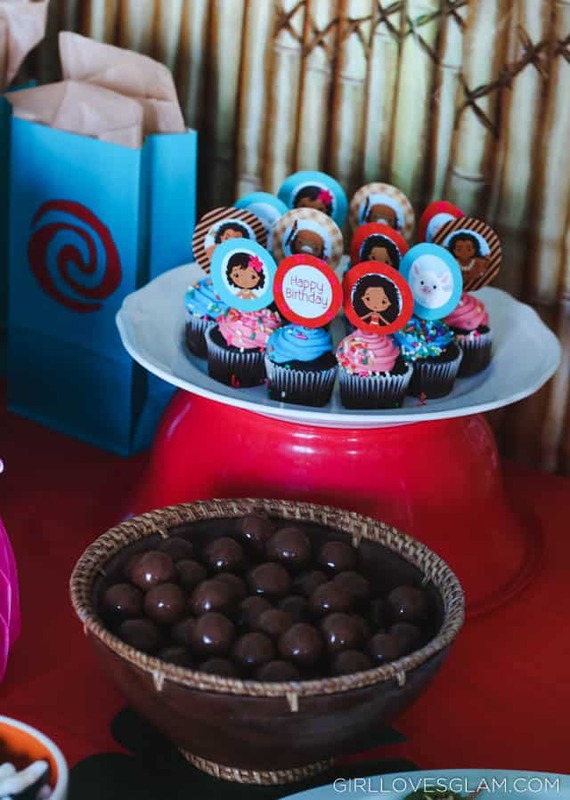 That is why it was no surprise to me when my daughter told me she wanted to have a Moana birthday party! 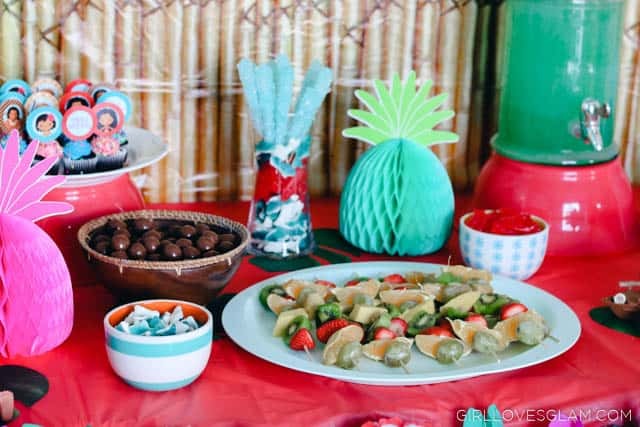 I was excited to create a Moana party, but didn’t want everything to be so character themed, so we went with an island luau with a lot of Moana inspiration. I just love how it all turned out and it was a blast! 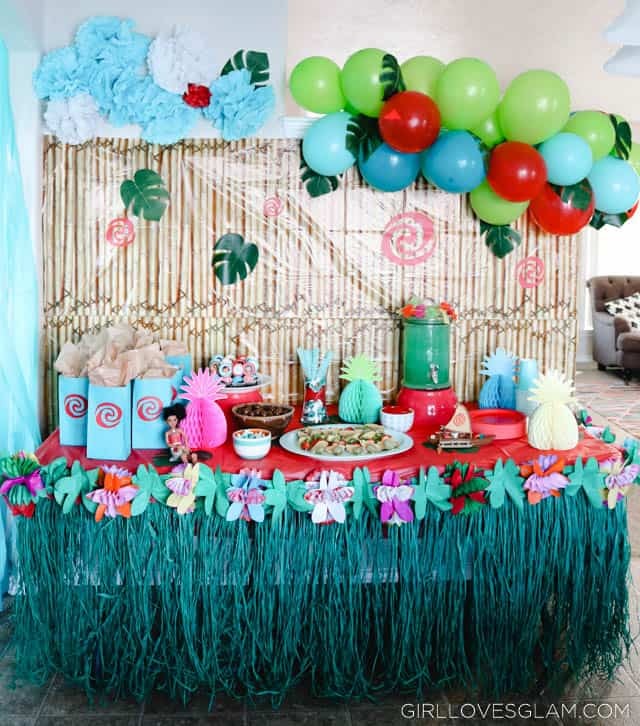 First, let’s talk about the decorations… Because her birthday is in January, there was no way we could have an outdoor luau. 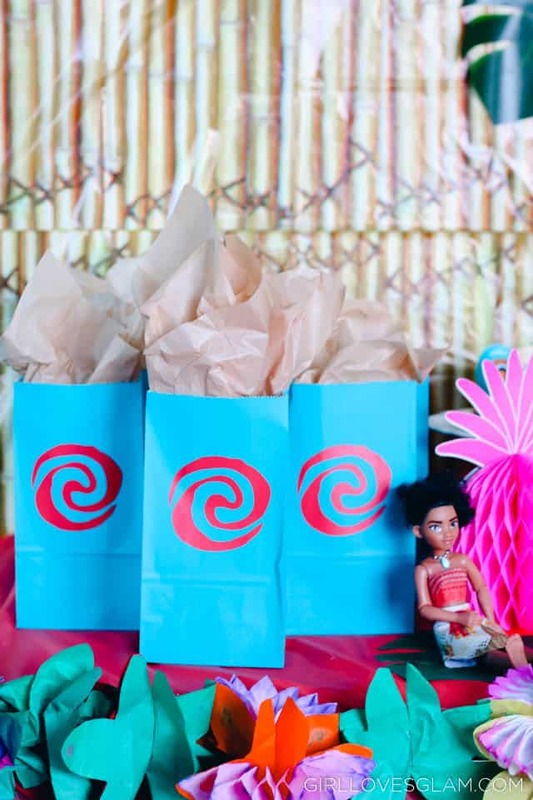 Those summertime birthdays have it good when it comes planning a luau! During the winter, you have to get a little more creative if you want to have a beachy theme! My favorite part of all of the decor, was definitely the tropical balloon arch that went along our staircase. It added so much to the decor and was insanely easy to make! Depending on the size of arch that you need, you would need different amounts of each of these items. Honestly, I just bought balloons and totally eyeballed how many I would need and just went with what I had. Blow up the balloons with your balloon pump. Blow them up in different sizes so that they aren’t all exactly the same size. Get your fishing line and put a needle on it, start threading the end of the balloons onto the fishing line. Make sure to mix up the colors as you go. 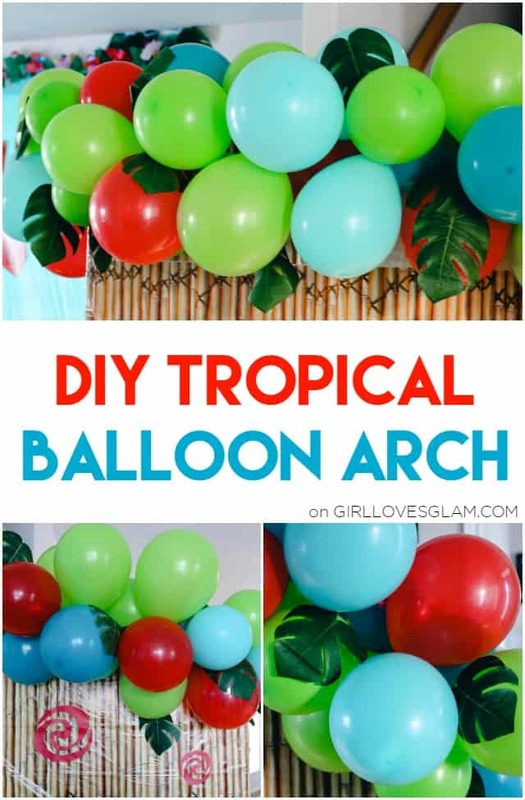 Once all of your balloons are threaded onto the string, tie your string off and you have yourself a balloon arch! Put it where you want it to go and put glue dots onto the back of your leaves. Stick your leaves onto your balloons. It is amazing how much these leaves add! I backed the walls with these bamboo table cloths and I love how much they helped transform the space. I added a few of the tropical leaves and some vinyl cut out to look like the the swirl from the heart that Moana is trying to deliver in the movie. For the serving table, I used this amazing tissue flower garland around the table that added SO much to the table. It looks like a lot of work, but it was literally just taking it out of the package and putting it on the table. The grass table skirt that I used is no longer available, but I found a similar one here. 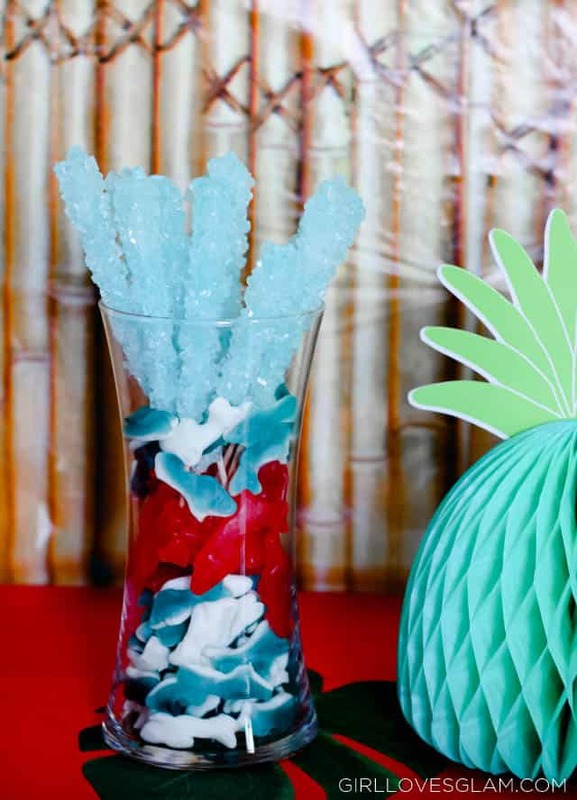 The decor for the table itself, was pretty much just some Moana toys that we already owned and these cute pineapples. I wanted to have plenty of room for the food and goodie bags! We had lots of candy that the kids could bag up and add to their goodie bags when they left. We tried to keep with the beach theme by serving gummy sharks and Swedish Fish. I also got these blue rock candy suckers that were a huge hit! I was able to find big malted milk balls in the bulk food section of my grocery store that we served so they would look like coconuts! Coconuts are a big part of the island that Moana is from, so it was fun to have our miniature “coconuts”! I didn’t want to completely overload the kids with sugar, so we also served fruit as well! The kids actually were really excited to eat their tropical fruit. I just bought cupcakes from Walmart and added the little cupcake toppers myself. 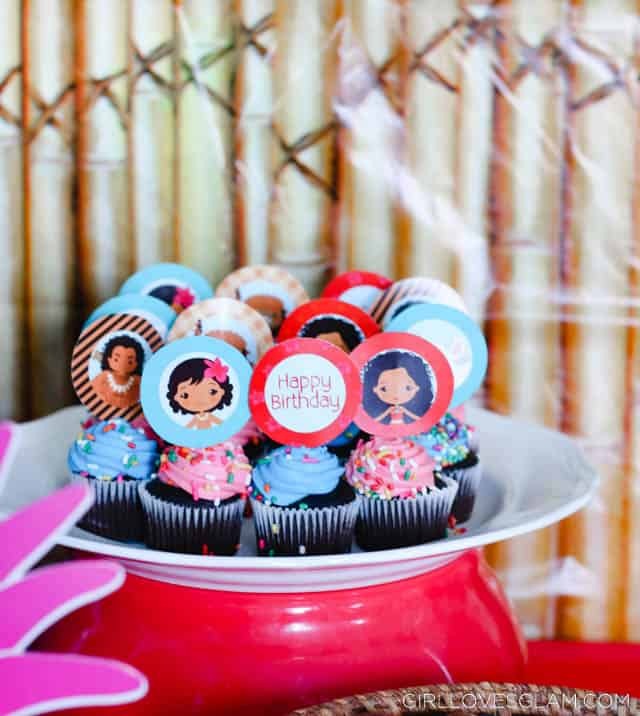 I found the cupcake toppers from the EmmieCakes Etsy shop. 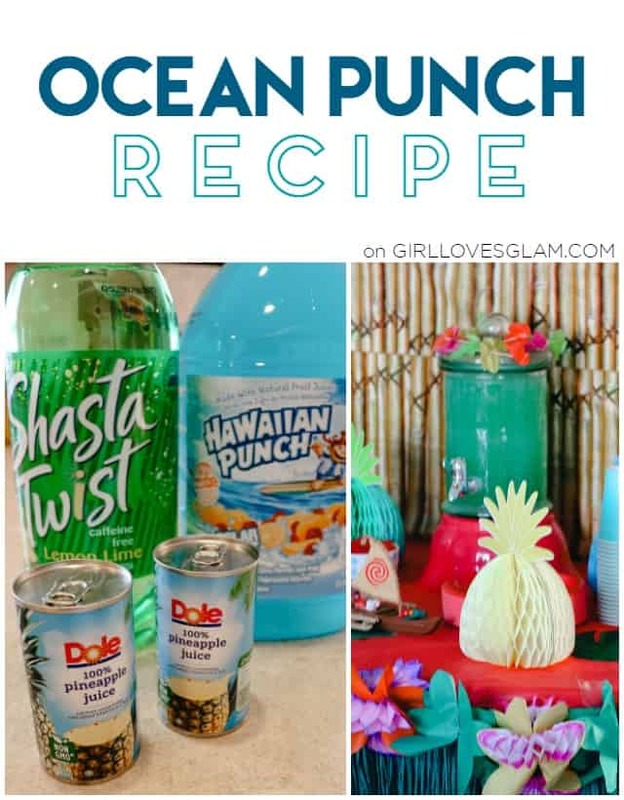 We made a fun ocean punch to serve as well! It was delicious and super easy to make. Mix together equal amounts of the soda and the Hawaiian Punch, then add about 1/4 the amount of pineapple juice as you did of the other liquids. It isn’t an exact science. Just kind of add and taste as you go. These three ingredients together taste really good! The goodie bags were just plain blue bags that I added red vinyl to. We gave the guests tropical temporary tattoos, luau rubber ducks, island puzzles, and bubbles. They loved them! I was able to find this darling banner on Catch My Party. 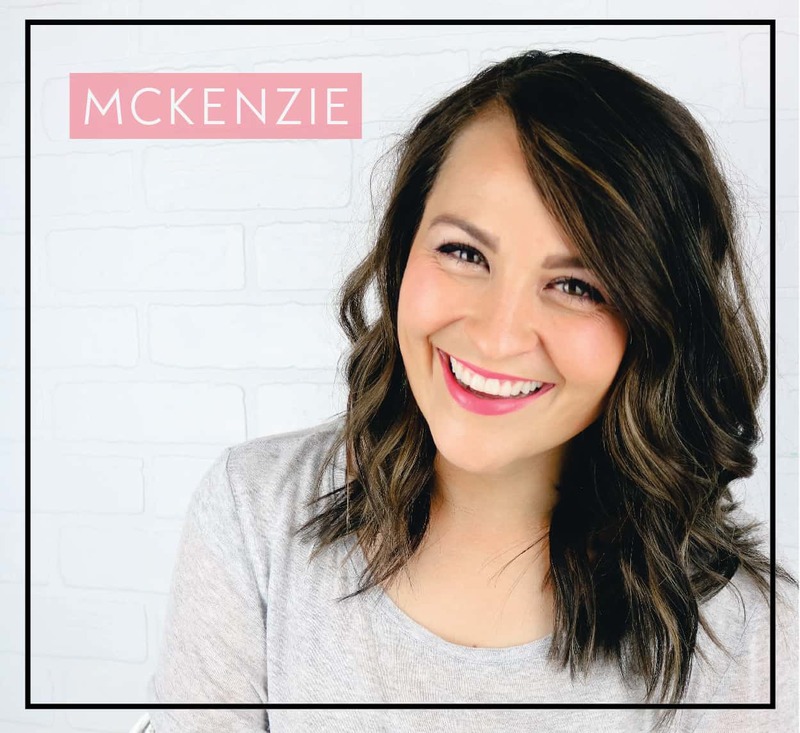 It is even a free printable! So that I don’t overwhelm you in one post, I shared details of the actual party in another post. 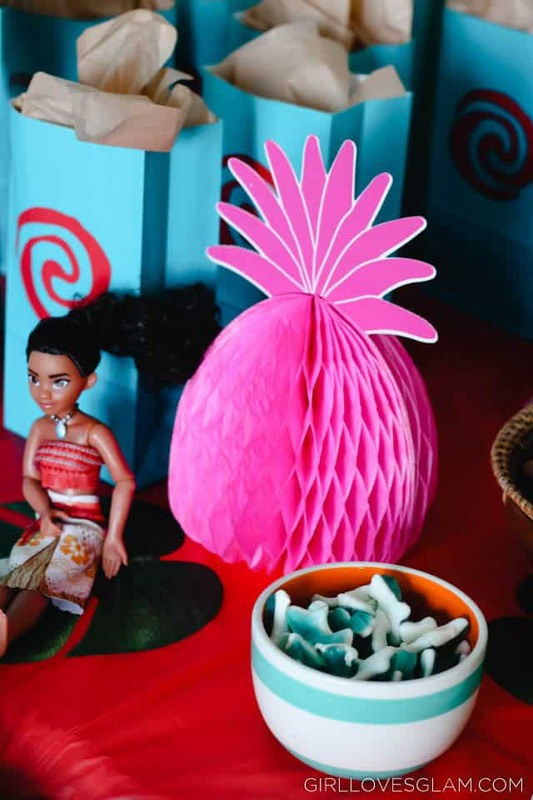 This post includes all of the activities we did and free printables for Moana bingo and a craft! Just click on the photo below to take you to that post. If you are looking for the best prices on Disneyland tickets and even discounted tickets for Character dining, definitely get your tickets from Getaway Today! They have saved us lots of money on Disney vacations! If you book a Southern California vacation, you can use the code GLG15 to get $10 off too! 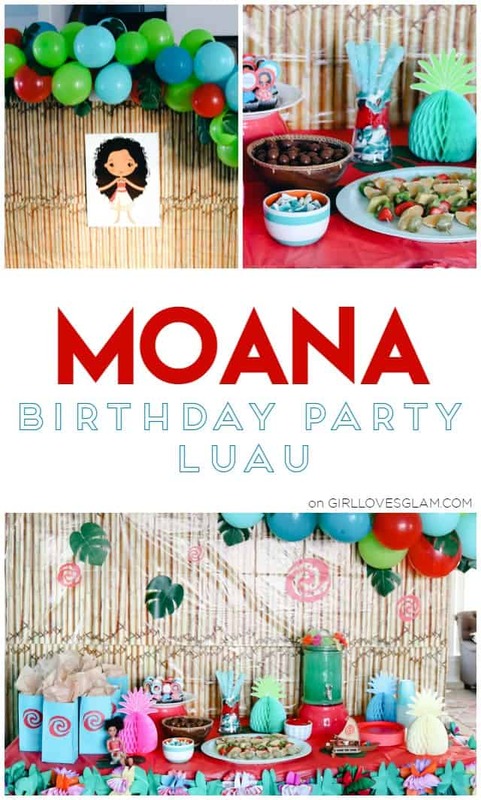 Glad to know about the Moana birthday party theme. Little things which you have added to decoration contributes a lot. Even those are so pocket friendly and looks great too! Even I have a winter kids and these ideas are really helpful. Thanks for sharing! 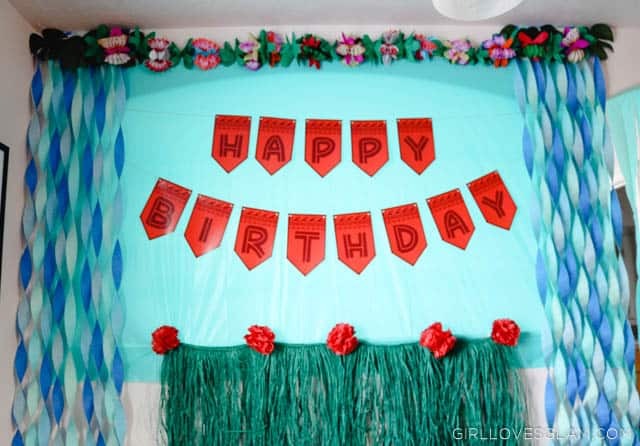 Here I get some another pocket friendly birthday decoration ideas: http://crazybirthdays.in/. Might help others. Thanks for sharing! I love the balloon arch! Can I ask how you attached it to the balloons to the wall? I tied the fishing line to the wall and used double stick tape where I needed it to add extra support. Hey , it looks awesome! Where did you get the sugar cane wall paper / backdrop? Hey , Everything looks BEAUTIFUL !!! Where did you get the sugar cane/bamboo background/wallpaper?